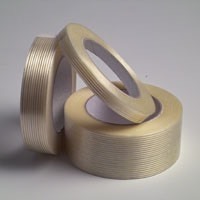 Self adhesive tape with polypropylene backing, reinforced with longitudinal fiberglass filaments, with synthetic rubber adhesive. Recommended for heavy-duty packaging operations. A good alternative to the metal strapping tape.